What do the fields under "Sales" page mean? On this page, you'll be able to configure payment information. The Customer Accounts field is required and allows you to use one customer account for the entire marketplace instead of creating a new customer each time. Enter a default customer name to use. We recommend using an identifier like "Amazon MX Customer" or "Amazon US Customer." We also highly recommend that you use one default account because individual customer accounts will gradually slow down QuickBooks Online. The Undeposited Funds Account field is required. This account is where all your current Amazon sales proceeds go, so you'll need to select a Bank account. The amount in this account will be similar to your current sales proceeds in Amazon seller central. The optional Payment Method field allows you to select how you'll be paid. 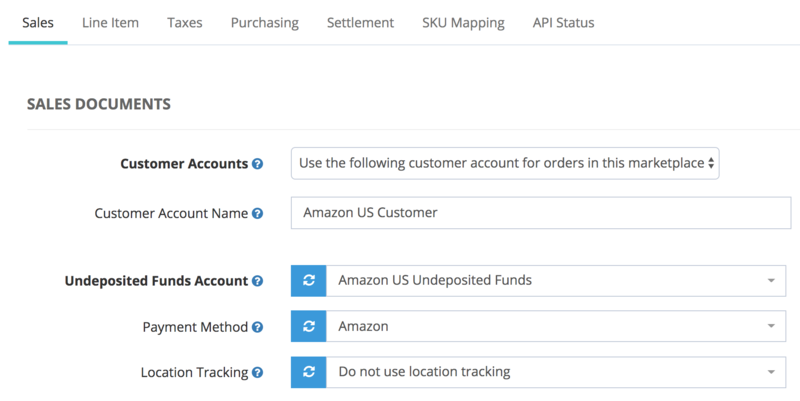 You can create a new Payment Method in QuickBooks to set Amazon as a payment method. If you enter different payment methods, you can run more detailed reports on the different types of payments. The optional Location Tracking field is available if you want to map a location to your marketplace. You have to enable Location tracking in QuickBooks Online to use this.